“Why? Because!” – Judy Garland asks and Fanny Brice answers in “Everybody Sing”! “Why? Because!” sings Judy Garland and Fanny Brice from the 1938 musical, Everybody Sing. Although not a short subject, I couldn’t resist showing this film clip with Judy and Fanny together. Obviously, Judy needs no introduction, but Fanny, on the other hand, might for many of you. Fanny does one of her best characters, “Baby Snooks” in this film clip. A two-star, Hollywood Walk of Famer, Fanny was born in NY in 1891. A cerebral hemorrhage ended her life in 1951. Judy Garland stars in Everybody Sing a year before she wows us in the 1939 movie, The Wizard of Oz. Keep an eye out for Judy’s witch pal, Billie Burke (Glinda), if you get a chance to watch the whole feature of Everybody Sing. Thank you gcuriosidades for making it available on YouTube! “The Prisoner of Zenda”? No! “The Prisoner of Swing”! “The Prisoner of Swing” with a very young June Allyson singing and dancing with hoofer Hal Le Roy. Only a few minutes of this short subject are here, but it’s worth it to see 21-year-old June Allyson. Per IMDb, “When she was eight years old, she was crushed by a falling tree limb while riding a bicycle. She wore a back brace for four years and taught herself to dance by watching Fred Astaire and Ginger Rogers movies.” So glad June recovered; she gave us many musical hours of movies to watch! Hal Le Roy is always wonderful to watch too. A talented and distinctive dancer! A Warner Brothers, “Broadway Brevities,” short of 1938, which was a take-off of the 1937 “The Prisoner of Zenda” movie with Ronald Coleman. Thanks to GoodOldDaysReturns on YouTube! Already married by this time, the duo continued to work together for another twenty-nine years. No two were better at banter than these two! For all the real mentors and teachers in our world … YOU ROCK! Barbra Streisand’s little sis, singer and actress Roslyn Kind, talks to Unscripted on YouTube about being the baby of the family, and growing her career. I always knew Barbra had a sister, and recalled seeing and hearing her sing in the 70’s. As you watch this video, you’ll see how much Roslyn and Barbra look and talk alike. It’s uncanny! I think even more so as they have aged. Now, hear Roslyn sing. Perhaps, she has a deeper voice and less pitch control than Barbra, but their similarities sure prove their kinship. Nat King Cole? Tony Bennett? James Stewart? Nope! It’s Sammy Davis, Jr.! Watch Sammy Davis, Jr. “channel” Nat King Cole, Tony Bennett, James Cagney, James Stewart, Jerry Lewis, and more as he wows us with his on point impersonations of popular singers and actors of 1954! Many of you remember Sammy Davis for his clear voice and terrific tap dancing. However, you may not recall or know that he was an amazing impersonator as well. “Because of You,” a Hammerstein & Wilkinson tune that I grew up listening to, superbly showcased Sammy’s amazing ear and talent for mimicry. It looks like this 1954 TV appearance was done before the severe car crash that took his left eye in November of the same year. 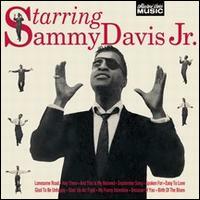 In 1955, Sammy released his “Starring Sammy Davis Jr.” album; on the cover, he is sporting an eye patch. This album introduced me to Sammy, which I will be forever grateful. Thanks, Mom! Do you know that a secret singer dubbed songs for Deborah Kerr in “An Affair to Remember” and “The King and I,” Natalie Wood in “West Side Story,” and Audrey Hepburn in “My Fair Lady”? And, even touched up some lines for Marilyn Monroe and other stars? You do? Well, how about this one…do you know that the secret singer is Marni Nixon and that she sang for all those movies without getting any credit? You knew that too? Okay, one last one…do you know that Nixon starred in “The Sound of Music” as a singing nun for the song, “How Do You Solve a Problem Like Maria?” Did I stump you on that one? If I didn’t stump you, give yourself mega movie points! And, while you are giving yourself those points, watch the first video of Marni Nixon narrating select clips of her career. Then, if you still want more, choose the second video to watch her sing a “Sound of Music” medley that was done during the filming of that movie.